We are seasoned practitioners of the science of foresight. Our proven proprietary process provides a comprehensive application of systems modeling and computational thinking coupled with transdisplinarity and sensory intelligence. We follow our six-stage process, although linear by description, the process is very fluid and non-linear in practice, allowing us to generate the revolutionary futures that we are renowned for. Although most of our projects are fully comprehensive and entirely customized to meet clients’ specific needs, we do offer certain other structured process modules that help our clients understand how best we can contribute to their future development. We create a future landscape which provides us with a solid foundation upon which we can determine critical future leverage points and potential future opportunities. The Future Vision Program grew out of a specific demand in the marketplace for a shorter, less expensive, early direction program that could help clients to identify potential future opportunities for their businesses. The Future Vision Program includes a Frontline Panel (see above). The output from the Frontline Panel is future-mapped with a wide range of futures insights. These include trends and emerging issues embracing industry, category, consumer mindset, demography, economy, environment, technology, politics, legislature, and relevant future social trends and influencers. To this mix, we also add the important ingredients of potential wildcards and disruptors. The Future Vision Program is particularly suitable when set against a future time horizon of 5-10 years. The visions generated by the program provide businesses, venture capitalists and investors with a solid startpoint from which to leverage future potential, futureproof their business and impact category change and leadership. 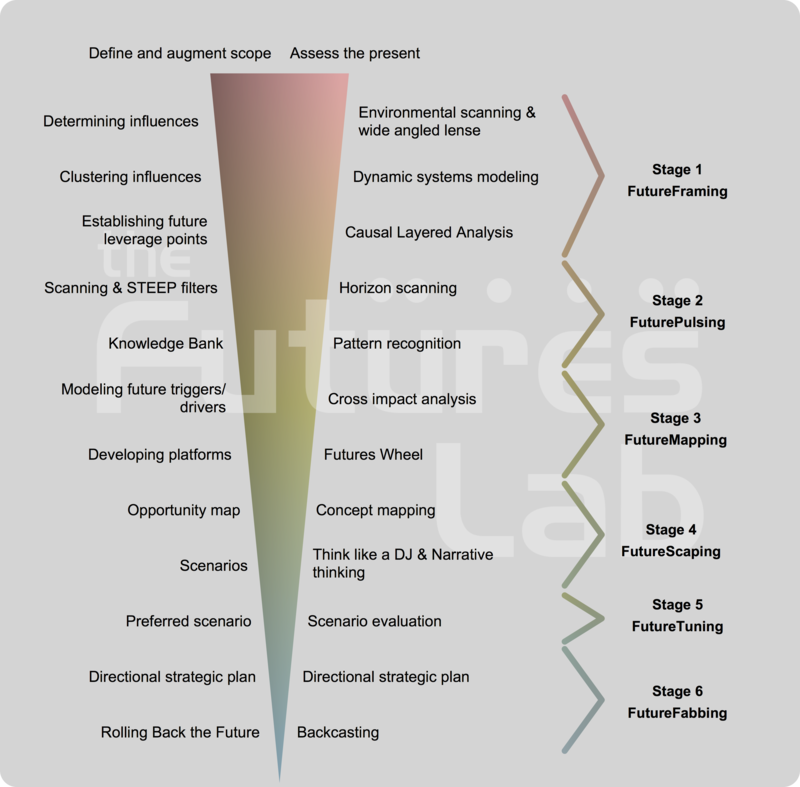 The FutureScan Program is The Futures Lab’s a proprietary horizon scanning program. The program builds off of early-stage future leverage points and scans each through 8-10 lenses (society, economics, politics, lifestyle, technology, marketplace, quantitative and experts), in order to create a future knowledge base. Inputs also come from our extensive database of weak signals and emerging issues and our proprietary TrendBank. Our expertise and work on weak signals is second to none. Weak signals are socially situated indicators of change in trends and systems that constitute raw informational material for enabling anticipatory action. While often still too incomplete to permit an accurate estimation of their impact they are fluid enough to stimulate imaginative thought patterns that can often turn them into unthinkable potential. They are the essence of discontinuity and provide a rich foundation for futures thinking. The FutureScan Program details how in the next 5-10 years known trends and projected emerging issues will evolve in unexpected ways, and the Program also identifies game - changing potential directions and strategic platforms. Frontline Panels are a critical component of The Future Lab's unique approach to foresight projects. The panel consists of an eclectic group of 8-10 leading future-thinkers. It is not an expert panel, but a panel of transdisciplinary experts. Frontline Panels allow us to open new gateways and explore ideas. They are about hijacking unexpected signals and breakthrough ideas rather than the sort of incremental thinking often associated with more typical expert panels and focus groups.We have conducted around 150 over the past 20 years and our panelists have included everyone from spaceship designers to world experts in quantum physics, social engineering and neuroscience. We also call upon our futurist colleagues when appropriate. It should come of no surprise that our panels provide us with an array of start points for the development of paradigm-shifting concepts. They yield unique perspectives and insights that are otherwise unlikely to evolve. The panelists provide our discussion with balanced, innovative, unconventional input for future development. The Panel is run more like a forum-style workshop than an ideation session or focus group. Our panels have been described by participants as ‘conversations about the future’ - far more stimulating than the typical brainstorming session. This is evident in the output that we realize. Our panelists are drawn from diverse backgrounds, depending upon the assignment in hand. They have one thing in common – they are future-centric revolutionary thinkers. We choose to host our panels in inspirational, creative venues such as art galleries, photographic studios, futuristic buildings and hip clubs. Our panelists and locations are out of the ordinary, and it goes without saying that so too are our discussions. Focusing and distilling their combined insights and energy are both our challenge and specialty. Through our subsidiary The FutureXperience Lab, we are able to set up 'Living the Future' workshops and other future focused events that bring to life the outputs from our foresight work. The mission of The FuturExperience Lab is to provide the general public with exposure and experience to the amazing emerging innovations and cultural developments that help generate a positive feeling about the future. The science of foresight In addition to the science of foresight with its futures modeling and systems approach, we need rhizomatic, nomadic thinking, a heavy dose of fantasy and conjecture, the art of awe, assemblage, “mixing”, and a provocateur/renegade mindset and sensory armament. These are critical tools for creating a future that will lead to the ability to leverage discontinuous change to create competitive advantage.